I know that there are some of the English boardies who enjoy doing a bit of work with research and photography etc and most of the rest of us have lots of digital happy snaps so thought I might just give a heads up on one printing company. 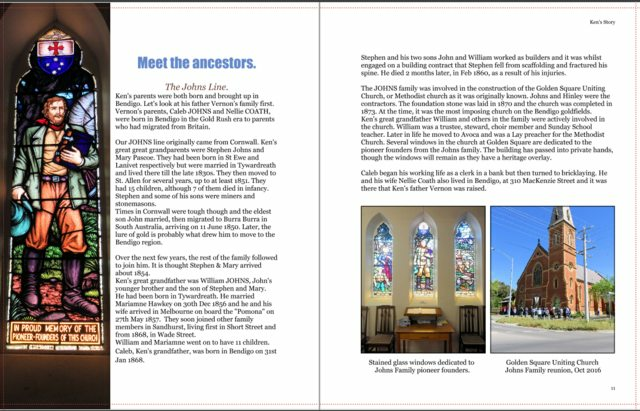 For several months now I've been slowly working on making a book, just to print up the story dad wrote about his life & to record a little bit of our family history. Plus add a swag of later photos. Just got the book back and I am amazed at the quality for the price. I can recommend them. The turn around was very quick-just over a week from ordering to receiving. The print quality was very clear, clearer than I thought it would be. And the price (although you need to join their email list and wait for special offers) was amazing. 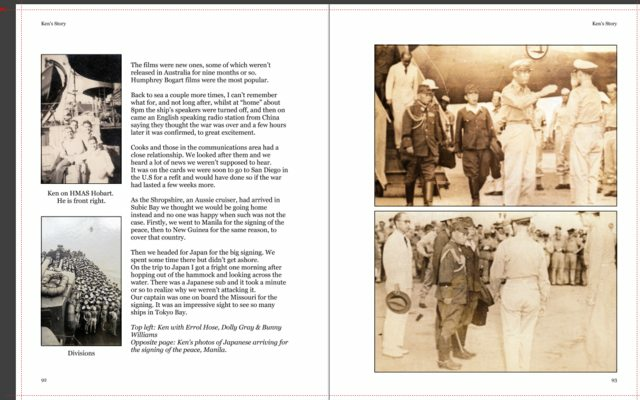 My book was 230 pages long -last 100 pages or so all photos. Cost was $60 plus tax & postage so about $80 all up. That included a paper upgrade. Very cheap compared to some other photobook companies. Best points: lots of layouts available to anyone who wants a good mix of print, photos or print plus photos. You can also edit the layouts, add different backgrounds and so on. So for anyone who has a bit of writing they want to put with photos, this is a good program. Downside-not many choices of book size & as far as I could see, no spellcheck in Booksmart so a few errors slipped past. Couple of samples of their layouts. you should scan it as a pdf and send to your rellies. I wouldn't have known how to scan it as a pdf. Not sure if the system would allow it as they sell the pdf for $4.95 so they probably block copying. I just paid for it. well if ya already got it as pdf as well, no worries, you should be able to make copies, can't see how they could stop you, try the left click copy then paste into a new folder..
i find the torch browser is good too, you can open pdf's on your computer in the browser itself, and actually save the pdf from there, and you don't have to worry about getting a pdf reader. I tried to send the pdf to a couple of people and found it was apparently too big a file to attach in emails. My email account suggested saving it to their dropbox and using a link from there. probably like how we do photos on this website. Thank goodness it seems to work for people, although not on every device. I thought the blurb link might be useful for a couple of boardies here who write their own things. You can actually opt into having the company sell your book (in print or as an ebook) if you want to. The cost is the Blurb cost plus whatever % you nominate as your profit. Obviously all that is not applicable to my book which is a personal one (and contains plenty of charts & things I copied straight from the web ) but for anyone writing their own little pieces, it could be worth putting them together in one of the magazine formats.